We all know the benefits of slowing down and disconnecting - reduced stress, better performance, higher satisfaction and reduced depression - but as our life pressures increase, how can we step back and find the time to take care of ourselves? Whether you're an executive needing time to contemplate big decisions, a burnout worker in need of a holiday, or a parent just needing some alone time, Switch Off provides a practical framework to help you slow down and take control of your life. Angela Lockwood an Occupational Therapist whose retreats, corporate education programs and keynotes help organisations, schools and individuals prioritise their health and wellbeing. Angela is the author of Switch Off. How to find calm in a noisy world and The Power of Conscious Choice. Question: Why did you decide to write Switch Off? 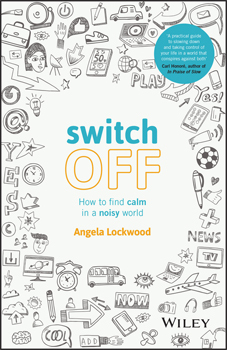 Angela Lockwood: I wrote Switch Off for one reason: there are too many good people who are doing everything they can in life but are finding themselves overwhelmed and exhausted by it all. I want to show those people how they can do whatever they want in life if they just slow down. Question: Why do so many of us struggle to find time to switch off? Angela Lockwood: Three things are adding to our struggle to switch off and that is being over-connected, overwhelmed and overstimulated. People are feeling the pressure of always being contactable, of feeling persistently overwhelmed with a never-ending to-do list and needing to create space to step away from the overstimulation of the busyness of life but they just don't know how to slow down long enough to make change. Question: What are the benefits associated with switching off? Angela Lockwood: Slowing down can feel like an impossible scenario when we lead such full lives but switching off isn't about doing more … it means doing less. When we do slow down and importantly integrate the skills of switching off into our lives, we experience better health, improved energy, clearer thinking, a renewed motivation for work and more meaningful and deeper relationships. The benefits are significant and if we are to keep up with the pace of life, we must slow down. Question: How can we switch off? Angela Lockwood: Many things in our life have become so complicated we do not have to overcomplicate switching off. The simplest way to switch off is to tap into what you feel you need. It may be taking a big deep breath (this is a great place to start), it may be a trip to the beach, having a drink with your partner, turning up your favourite music, cleaning out your desk, talking to a friend or going for a walk. Switching off is not just about being technology free, it is being in control of when it is time to chill and it is time to be -on'. Question: Who did you write this book for? Angela Lockwood: People know they are feeling overwhelmed, stressed and missing out on the good things in life, they are just too distracted to know how to step out of it all. That is why I wrote the book. My clients would share with me how they knew they were sick, stressed and exhausted but they just didn't know how to make a change. Whether you're an executive needing time to contemplate big decisions, a burnt out worker in need of a holiday, or a parent just needing some alone time, Switch Off provides a practical framework to help you slow down and take control of your life.